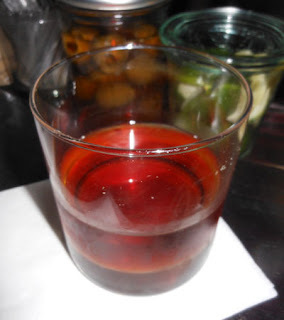 (*) Usually made with Cocchi sweet vermouth, but they were out. Two Wednesdays ago, I made my way over to the Blue Room where Chris Danforth was tending bar. For a first drink, I asked for the Columbus Exchange, a drink that Chris had created about a month or so ago. Chris thought about the New World rum and falernum as well as the Old World vermouth, amaro, and orange liqueur in the recipe, and he named the drink after the Grand Exchange, the widespread exchange of animals, plants, humans, and ideas between the Americas and Afro-Eurasia following Columbus' voyage in 1492. The Columbus Exchange offered an orange oil aroma that brightened the aged, caramel and herbal notes. A caramel, grape, and orange sip gave way to a rum, clove, and minty swallow. Overall, I was impressed at how well the rum and vermouth seemed to tame the S. Maria al Monte and its strong menthol signature.